Partnership among Schools /Twinning of Schools Programme in TS Schools 2017: Partnership between Schools, Partnership with schools, Twinning of Schools Programme, Linking of schools located in rural areas with Private or Government schools in Urban or semi-urban areas for interaction and exchange of experience: School Education Department SSA Telangana, Implementation of Twinning of Schools Programme to Selected Schools in the State. C and DSE Telangana - Rc.No. 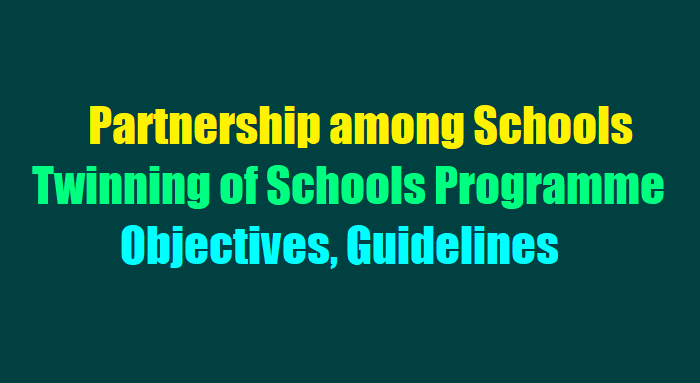 4029 ,Dated: 18.10.2017 :: Sub : SSA, Telangana State, Hyderabad - Partnership between Schools (Twinning) - Issue of guidelines - Implementation in selected Primary schools - Reg. Ref: 1) PAB approved budget for the year 2017 - 18; 2) Memo No. F.No. 2-8/2015-EE.3, GOI, Department of School Education, New dt: 12.01.2016. All the District Educational Officers and E.O: Project Officers of SSA in the state are informed that in the reference 2nd cited, wherein the Director, Department of School Education and Literacy, MHRD, GOI, New Delhi has devised a concept paper titled "Partnership among schools" which aim to linking of schools located in rural areas with Private or Government schools in Urban or semi-urban areas for interaction and exchange of experience. The rationale behind this programme is that it offer powerful alternative to four walled classroom chalk and talk method. It leads to instilling a sense of awe, which helps open young minds to introspection and new experience. This initiate aim to explore this new dimension of learning which will provide and enable students to understand and respect cultural difference and help to created, dedicated, committed, discipline and productive individuals. iii. Implementation of twinning at Mandal Level in 2 times for each school. The DEOs and E.O: P.Os of SSA is requested to conduct the Orientation to the Mandal Educational Officers (MEOs) on Twinning of schools alongwith the Shaala Siddhi Orientation programme, inturn MEOs will train selected schools H.Ms at Mandal Level. Further the DEOs are requested to give instructions to the Sectoral Officer - II to identify 25 primary schools with highest enrollment in the district and see that all mandals in your district should cover to implement the programme. The objectives, guidelines and questionnaire for students of the programme are annexed. The questionnaire will be provided to all the participated students. School Education Department SSA Telangana, Implementation of Twinning of Schools Programme to Selected Schools in the State. Select identify Primary schools with highest enrollment and submit same to State Project Director SSA. Issue Guidelines and instructions to field level and follow the time line to implement Twinning of school in District. Each selected school has to visit Higher school twice . Submit the comprehensive report of District Twinning of school to State Project office SSA TS.